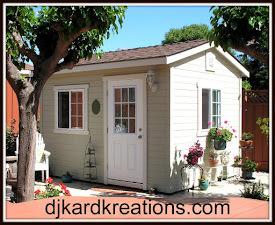 djkardkreations: NBUS Challenge #6 ~ Day Nine! NBUS Challenge #6 ~ Day Nine! Hello! How are you? Are you sick of me yet? I think possibly you are and that's okay cuz I would be if I were you! We only have one more day after today and NBUS Challenge #6 will be over. I'm keeping this uber short for you. At least I'm going to try. You do realize that I never know what I'm going to write until I start so I'm usually as surprised about the journey as you are! What you see on the left is a Bluebird (Sialia sialis) whose habitat is southern Georgia. It is clear that he suffers from a thyroid condition. This non-life-threatening condition results in pale chest featherage and hugely bulging eyeballs that are usually itchy from glitter and gloss. Let's call him Barry. One day while doing his morning constitution, Barry was astounded to see a rather large Easter chick off in the distance. Let's call her Easther. Barry calls out to Easther, who is obviously lost because Gallus Domesticus are not normally found in this exclusive gated community. But Easther keeps her little head down, purposely toddling onward, one chicken foot in front of the other. As Barry watches, she crests the hill and bobs out of sight. By the time Barry crests the hill, the baby Easther has disappeared. Eyes bulging precariously from his head, Barry whispers, "Happy Easter, Easther. You amaze me." 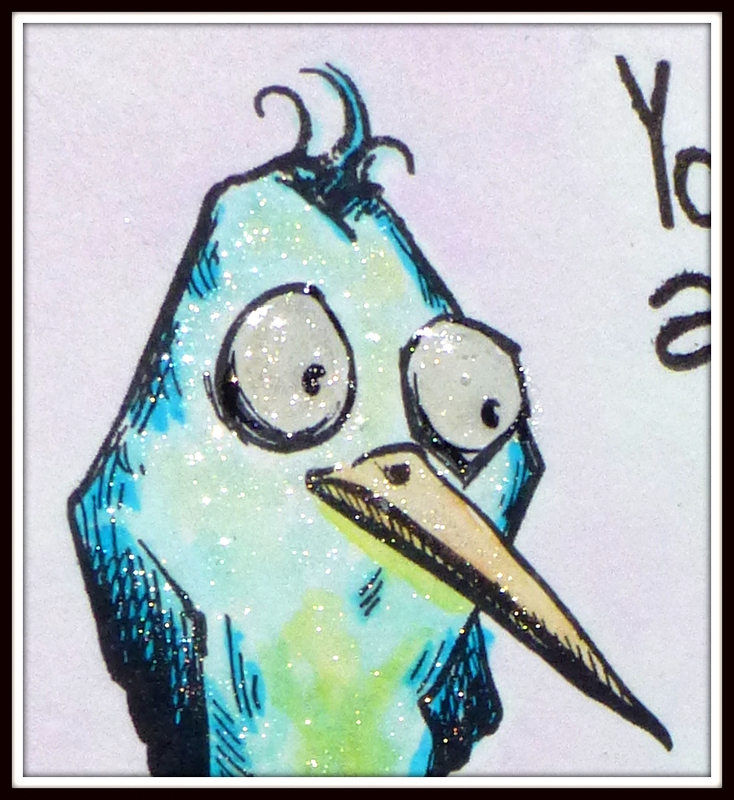 Several of my Tim Holtz Bird Crazy birds are NBUS. I'm not sure this one is, but I'm going to say it is or otherwise I will be fired as NBUS Challenge Chairman. I had to have these silly birds, yet I've only made a coupla cards in all this time. Recently I ordered the little wardrobe items for them and maybe you'll see them used more often once the hamsters start dressing them up like paper dolls. The little chick is from Kristal Clear Impressions which is sadly out of business. The sediment is from Alley Way Stamps, "Words to Live By." 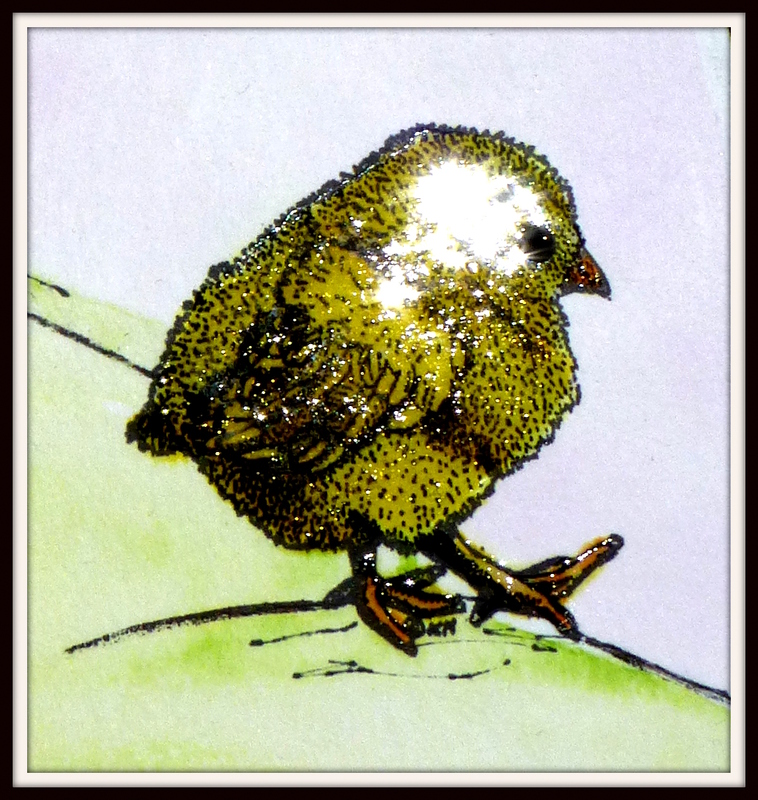 These feathered friends were watercolored, glittered, and glossed. Addicted to Stamps and More: Clean and Simple (CAS). STAMPlorations March CAS Challenge: Anything Goes with an option of yellow. Head's UP! Some of you do not have blogs and when I click on your name in the comment, I get a "no reply blogger" message or a Google+ profile with no information. That means I have NO WAY of contacting you if you are a winner! You must leave me your email address in your comment or email me separately with the information. If I can't find you, you can't win a prize! Thank you!! Darnell, I cannot imagine a time when I would be 'sick' of you and your posts ... it is always a delight to read your posts and start my day with a smile. I step out to work with a smile in my heart and a chuckle in my head! Great card! 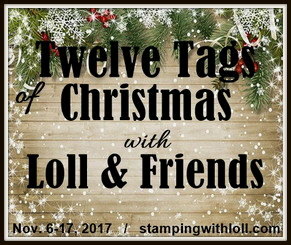 I'm very like you I just had to have the Tim Holtz birds but have only used them a couple of times ... but there is still time! Such a delightful and fun card, Darnell. Like you, I just had to have these birds, but they were always out of stock whenever I was ready to place an order. Now that I finally do have them, all I have used them for is some watercolouring practise. Maybe I should try to put at least one of them on a card in time for me to enter your NBUS challenge. I don't think I'll ever get tired of reading your posts. I have these birds and I haven't used them yet, thats so sad. I will have to leave them for the next one cause this is my third post. 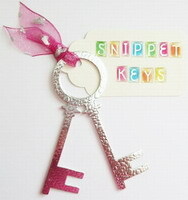 Cant believe you have added to the gift vouchers with those wonderful Brusho's. Someone will be very happy. A post a day or two even or more if you like cause I always enjoy your humour. You have a way of lifting us all up. Loved your card today it put a smile on my face. Very windy and cold outside so to smile just brighten ones day. Cute card!! Love your stories but have to remember not to put hot coffee in my mouth when reading them. LOL! You should write a book Darnell - for adults of cause. Your card is great but the story behind it cracked me up. I really did LOL. That's a lovely card Darnell !! Wonderful post Darnell and I adore your card!! Love those stamps! Ha ha..a fun card ! just one day left for NBUS challenge..I wish it was a bit longer . Darnell, you are just a hoot. Fun story and cute card you have made up. I've done my 3 entries but still have lots more NBUS. Loving your story about Barry and Easther - your adjective of "professorial" for Barry is perfect! Sadly I see the plight of Easther on a regular basis. There are tons of feral chickens on this island and at almost every cat feeding station there are chickens. Thankfully the cats keep the chicken population from exploding. There was a hen with 14 chicks on Monday morning. Today she has 3 chicks. Cute as the little fluff balls are and sad as it is if it weren't for the cats we'd be drowning in chickens! And those cats are impressive. I watched a Chewy eat an entire chick in less than a minute. There was not a scrap of anything left behind. LOL! Oh Darnell you tell the most fabulous stories! I bought the Crazy Birds, and dies too...... I have used them, but not regularly ..... take special humor. Love the glitter & gloss, Darnell! Lost my mojo, but maybe I can get one more NBUS crossed off my list! It has to be said that you are quite the raconteur. You really need to write a book. Enough with the high-falutin' words. LOVE the TH bird with that chick, wow! Makes you wonder why the company went out of business. So glad that you've revived and winked it for this card (which, incidentally, is too funny). Can't believe it's Day 9 already. How could we be sick of your posts - they are such fun. love coming to visit Darnell, your fabulous writing and imaginative lexicon are entertaining. 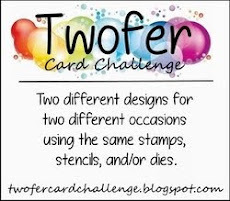 Your cards are the cherry on top of fabulous time spent with a warm and funny friend. We are all lucky who choose to visit. I love the combination of two very different birds, and your story is perfect. Hugs. I don't know which is cuter - your big eyed bird or your post!! LOL Thank you for the giggles. Great story, great design and fun birds! what more could you possibly want??!! Fabulously fun card and tale about Barry and Easther! You are a riot Darnell! THis made me smile!! You are just too creative! You had me at Sialis! Oh Darnell... You DO make me laugh - way out loud!!! Sick of you?? Never!! I've just had a lovely time reading all your NBUS posts and drooling like Dan over your gorgeous cards. And I've managed to play along, yeah! You made me laughing with the story on the card . :-) Your ideas are always fabulous. I love your blog posts so much! Great card! Sick of you? ....... never!!!! What would I do without my daily giggle. I finally got several cards completed AND photographed to play in your challenge! Color me happy!! I must say I love your crazy bird card...I have the birds, all their accessories as well as ALL the dies that go with them! I haven't used them nearly as much as I thought I would, and now I'm debating with myself as to whether or not to but the smaller version of the birds....decisions, decisions!!! Have a wonderful day! I am not sure but think Blogger may have gobbled my comment, grr, I've been having issues all day because of the Picassa to Google+ change so not a happy bunny with that! However I am very happy I got a chance to play along huni. Don't worry about visiting me or entering me as I have my lovely Tim Holtz stamps because of you huni so will be forever grateful. What a lot of wonderful entries in your gallery, Darnell! Loved your Easther story! LOL I always love your stories! I must confess that I loved the story, but I was waiting for a happy end, instead the only happy here is Easther... poor Barry, he must have turned white! Just so sweet...love your wonderful birds. I love your cards and the great stories too! I also enjoy NBUS and look forward to it every year. Ha gave me a giggle Darnell. very clever. As much as I love the Tim Holtz Crazy Birds, you would think I would have one, or two, or ten....but instead I'm left hearing stories about their adventures as they stumble along through this world and some mythical one where chickies may be large but their mothers are even bigger. I'm so happy you were able to give some of your NBUS love this month, and am hoping that means you're feeling better. Thanks for a fabulously fun challenge and the motivation to dig deep into my stash. Oh Dippy, what a wonderful card. Poor Barry has such a puzzled expression on his face......not surprising when that huge shadow passes! You can post a dozen times a day and we wouldn't get tired of you. 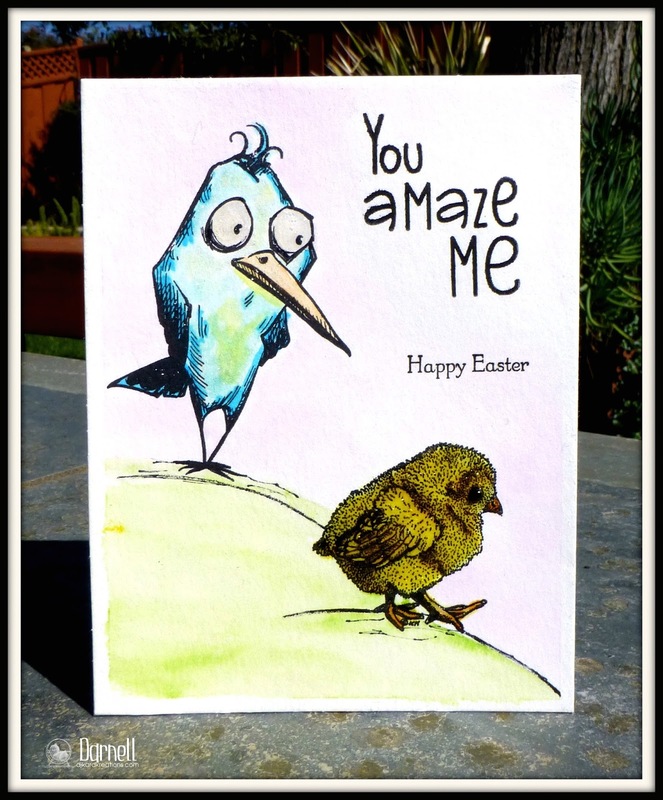 Love the card and love the story! Oh, and I love YOU too! I think Barry's eyes are bulging because he has just witnessed a traumatic incident and is wondering "Am I next?" You should send this to CASoloogy's "laugh" challenge. OK, so your card made me laugh, and THEN your accompanying story made me laugh HARDER! You are too creative for words, Darnell! You are dripping in creativity, how can you STAND it? :) Can Barry hear me yelling, "Watch out, Barry! The momma is right around the bend!!! Turn back, Barry!!!" Yep, I'm enthralled with this story. And your card. 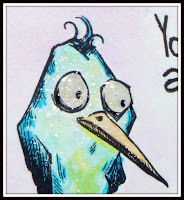 And the fun crazy bird image and your awesome coloring. Thanks for joining us at CASology this week, Darnell. Totally made me laugh! Congrats on your CASology Honorable Mention. Well-deserved for this hilarious card.